My Politic is making their first ever studio album "12 Kinds of Lost" at the Sound Emporium in Nashville TN. With a mix of Folk, americana, bluegrass, country, blues and roots music it promises to be their most eclectic effort to date. Appalachian Americana band out of Missouri debuts strongly on their first studio album. Every song hits home in a different way, and they manage to avoid the bro-country laundry list tropes that seem to plague even the most traditional artists to grace the radio waves. 12 Kinds of Lost consists of storytelling not seen very often in Country music. They join Country and Folk music to make a work of art that everyone will want to hear. While the majority of the songs are slow ballads, there is still a sprinkling of uptempo songs throughout the album. Every song tells a story. Their songs are deep, dark, and full hard truths on reality. They make sure to mention just about every hard topic imaginable. “Bored Young Ghost” is a song about being or feeling stuck and empty. “When I die here, my ghost will be as bored as I am.” This song will speak to a lot of people because it speaks the truth about how many people feel at some point in their lives. “Only Human” describes the feeling of being depressed and growing apart from those you love. “I wonder if I’ll ever get a chance to make it right.” So many people these days struggle with depression that I believe fans will find that they can relate to this song for many reasons. “Devil’s Playground” again speaks of the world we live in today. We live in a time of religious growth, that is growing parallel with society’s efforts to deal with rises in drug use and abuse. The songs were beautifully co-written by the members of the band. My Politics is made up of Kaston Guffey, Nick Pankey, Wilson Conroy, Will Cafaro, Jen Starsinic, and John Wood. Guffey and Pankey met in Missouri at a young age and became My Politics in 2006. They moved to New England for a while before they found their home in Nashville. Their house has become a staple of sorts for other musicians passing by, and is coined the Mad Valley Lodge. This is not just a band, it seems to be that they have become a family. They tell stories that are hard to hear, but true to the core of people around the world. They don’t hold back knowing that there are many people out there that can relate in some shape or form. 12 Kinds of Lost captures the dark truth of the world we live in. People from all walks of life will hear these songs and find that they can relate in one way or another. It was so good I found myself wanting to continue to listen over and over. The songs speak for themselves. 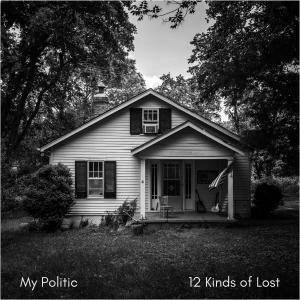 I encourage everyone to listen and enjoy the fantastic tracks found on 12 Kinds of Lost. Recorded at The Sound Emporium A Room, Nashville, TN. Engineered & Mixed by Adam Taylor.